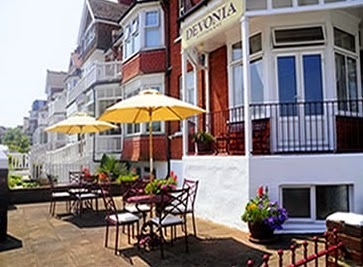 Devonia offers bed and breakfast accommodation in a Victorian building located on the seafront in Eastbourne in East Sussex. The B&B is located close to the pier and the beautiful beach. 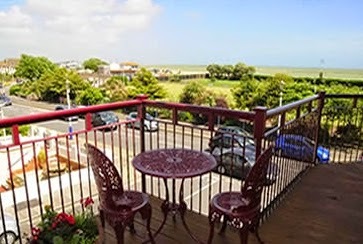 There are a number of guest rooms at the B&B some offering gorgeous sea views and one even has its own private balcony. Breakfast is served in the dining room which is located on the ground floor from 8.30am - 9.30am. There is a choice of cooked or continental breakfast available. Cereal, smoked haddock, croissants, cheese, ham, scrambled eggs on toast and baked beans on toast are just some of things you can choose from. To see the full menu please visit our website. The local area has a range of attractions and activities and offers something for everyone. For the adventurous there are sailing, windsurfing, hiking and golfing activities to be enjoyed. You can take a trip to the Sussex countryside and see the historical villages. South View offers comfortable homely accommodation in the centre of the picturesque village of Lynton in North Devon. Each of our five en suite guest rooms have been individually newly furnished to a high standard and comfort that reflects a homely atmosphere. Linked by the Victorian Cliff Railway with its twin, the harbour village of Lynmouth, Lynton is the ideal base to explore the surrounding countryside with its abundant wildlife and spectacular coastline. South View is just a short walk from the Cliff Railway with its magnificent costal views, and the beautiful scenery to be found at The Valley of Rocks. Rosemary Cottage is a bed and breakfast that is located at Hooe, near Battle in East Sussex. The accommodation is in a rural setting with beaches and golf courses nearby. You can visit historic towns, castles and much more. The main guest accommodation has its own small terrace and private entrance, it offers either twin beds or a super king sized double bed with en suite shower, TV and tea/coffee making facilities. This room is large enough to accommodate a childs travel cot. There is an adjoining bedroom which can accommodate 1 or 2 children/adults. There is a further double room available inside the cottage which has use of the bathroom opposite. Outside is a private decked area where you can sit and enjoy the afternoon sun. The B&B is within walking distance of 2 pubs and for exploring the South Downs and East Sussex. If you want to go further afield then you can visit Kent and Surrey. Arbour Guest House in Oban is very close to the town centre and offers guest accommodation. Built in 1880, Arbour Guest House retains many of its Victorian features, high ceilings and original cornices, with all the comforts of a modern home. The Atlantis Leisure Centre, The Corran Halls,Tennis Courts, McCaigs Tower, the Cathedral and local Cinema are all within easy walking distance. Castle View Bed & Breakfast offers accommodation and breath taking views of the rolling countryside and is located in Balleen in County Kilkenny. This B&B includes a warm welcome and complimentary tea, coffee, homemade apple tart and scones on arrival. Castle View bed & breakfast is located close to nature trails and golf courses. We are within easy access of the city which has many historic sights, pubs and cafes. If you want to go further afield then visit Waterford and the Rock of Cashel. Hedges Bed & Breakfast is a small, family run bed and breakfast that is located in the village of Wootton Bridge. The B&B is just 7 minutes from Ryde and 3 minutes from Newport. There are a mixture of double, twin and single bedrooms which all offer TV and Wi-Fi. For breakfast guests are served a full English breakfast and they can also relax in the residents lounge. The B&B is within walking distance of shops, doctors, takeaways, pubs, restuarants, Post Office and churches. The Isle of Wight has many festivals during the year including the world famous IOW Festival, Jazz Festival, Ryde Arts Festival, Cowes Week, Walking and Cycling festivals, The Bestival and the Island's Carnival season, offering a wide range of activities through out the year. Our location is ideal for house hunting, pleasure or business. Kennington Bed & Breakfast is an 18th Century Georgian house that has been restored into a bed and breakfast. Located within Central London, Kennington is within the hearing of the division bell - the boundary set by Parliament. The b&b rooms have flat screen TVs, Wi-Fi, bathrooms, Egyptian cotton, original fireplaces, corniced ceilings, original Georgian shutters and cast iron radiators. We are ideally placed in the heart of Kennington and just 50 metres from the tube station. Gatwick Belmont Hotel offers superior B&B accommodation that is perfect for anyone who is looking to stay in the area to explore Surrey or for people who are making stop overs for Gatwick Airport. Despite our close location we are not in the flight path so you can be assured of a good night’s rest. Our hotel reception is open for check in 24 hours a day so whatever time your flight arrives, there's always someone here to welcome you. Once you have settled in your guest room why not come and sample our fine wines, beers or variety of branded drinks available at the Belmont bar with comfy sofas and gentle music. You’ll soon understand why our bar has become a popular venue for the exhausted traveller or an excited holiday maker.